Both Kickstart and AutoYast allow me to prompt the person sitting at the console (who’s impatiently waiting for installation to finish) for the password, but that’s useless for automated installs. One possibility is to generate machine-specific configuration templates on the fly, each containing a different password for root, but that’s really only a workaround. So, is the current Worst Practice™ to have dozens, hundreds, or thousands of machines left with the same hard-coded password in them? Probably. And how, and how frequently, are these passwords rolled (i.e. changed)? Never? build the machine (Kickstart, AutoYaST, etc.) with a hard-coded password for root as configured in the appropriate deployment system. This password will be used for a very short time only, until the setup has completed. obtain a machine-specific root password at the end of the installation, optionally during each system startup or on-demand. 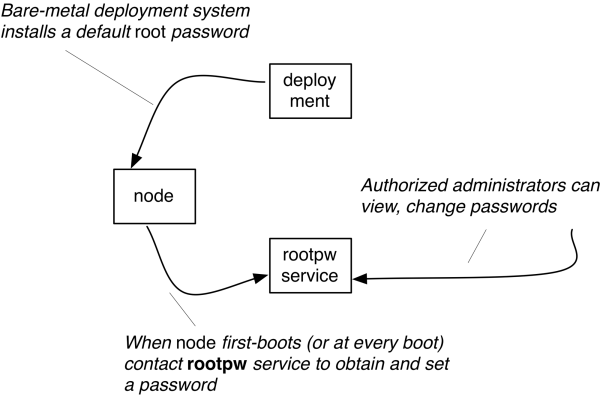 logger -p authpriv.notice -t rootPW "Password changed for 'root'"
Authorized system administrators can use the show command to display the clear-text password for a node, and they can force generation of a new random password with the new command. The back-end machine containing the password database, obviously needs to be well protected. I have to let this sink in a bit, but I think it’s overall better than what I’ve seen most places. Do you have any thoughts or suggestions?